It wasn’t just the glorious sunshine that warmed our hearts over the weekend. 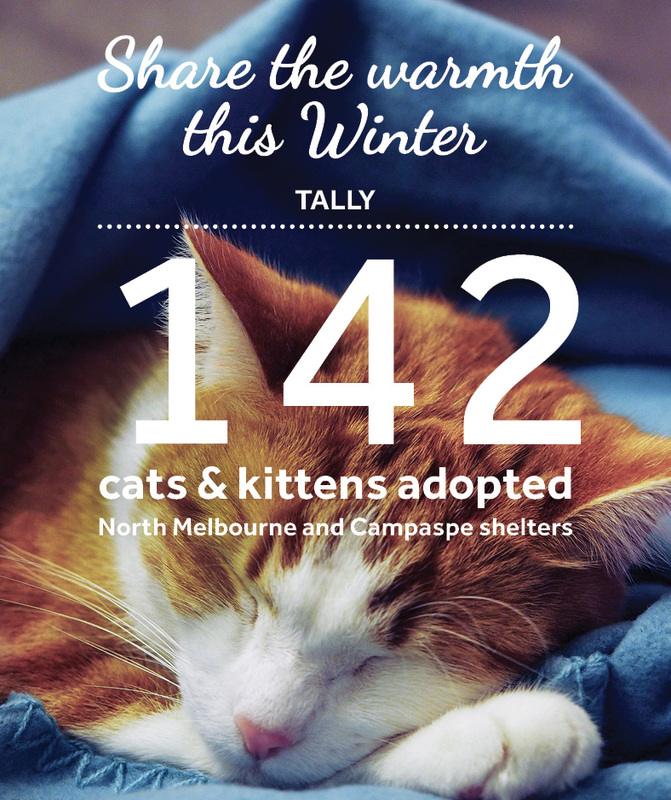 Over two days 41 cats and kittens from our North Melbourne and Campaspe Shelters made the journey to their new homes to Share the Warmth with their new families. And, we are pleased to report, the terrific weekend of adoptions has now brought up the total number of adoptions to 142 fabulous felines since we launched the campaign on May 5! For Campaspe Shelter Manager, Kate Kemp, the community’s response to the campaign has been encouraging with 19 cats and 22 kittens adopted from the shelter since the beginning of the campaign. “Two weeks ago we were inundated with so many cats and kittens, our condos were bursting at the seams! “Thanks to the effort of the Echuca community adopting and advocating for the cats currently in our care we have seen the largest fortnight of cat adoptions this year,” said Kate. Despite the great response from the local community, the Campaspe Shelter is still overrun by cats of all ages, colours and temperaments. “We find that as soon as one cat or kitten is adopted, another deserving feline takes his or her place. For example, over the next week alone we anticipate another 17 cats and kittens will be put up for adoption. Kate explains with kitten adoptions leading the way at North Melbourne and Campaspe, a number of the Home’s long term adult cats continue to be overlooked in favour of their younger shelter mates. “One of our favourite long term residents is Dudley, who is the eldest cat up for adoption at Campaspe. He has been up for adoption for 183 days and is just one of many adult cats taking a little longer to find his forever home. “We want to see the community continue spreading the word about Share the Warmth so each and every fabulous feline up for adoption finds their own loving home and receives the love, care and attention they deserve,” said Kate. All of our adoption candidates come desexed, microchipped, wormed, vaccinated and vet checked, which equals more than $300 of vet care, included with each cat’s adoption. Renters will need to provide a Rental Agreement showing approval to keep a cat. To receive the discount, you will need to complete our Pet Licence Test at our shelter or online. Adopt: View our terrific range of cats and kittens at dogshome.com. Visit your nearest shelter to meet them in person — our staff are keen to find you your perfect match! Foster: We need fosters to care for cats and kittens for an average of two to four weeks. This is a terrific way to give a cat time out in a normal home environment, while creating vital space at our shelters. All expenses are covered and successful applicants will be notified within two weeks of applying. For more information visit our foster care page. Advocate: If you cannot adopt, why not advocate for a cat currently seeking a home? Share adoption candidate profiles via your Facebook page, email or via the good ol’ word of mouth!